Back in July when our family was on vacation in Ottawa I started crocheting a scarf. I know a scarf in July seems silly, but I had the yarn in my basement for months, I was very interested to work with this yarn, and I figured a scarf would make a great portable project. 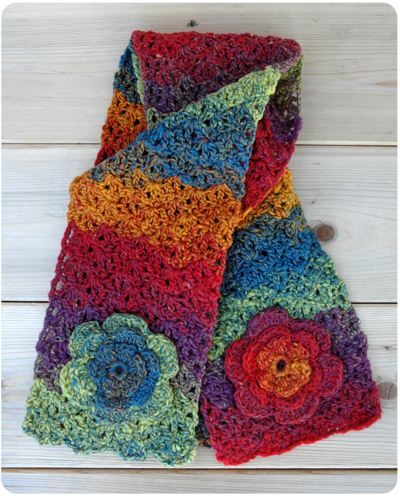 The scarf is made with Bernat Mosaic - a sort of variegated and twisted yarn - and the color is Optimistic. I love the name of this color and to be honest, I chose this particular color in part because of its name. I found the pattern for this scarf in a book of patterns specifically for Mosaic Yarn. The book was published by Bernat. I love that the colors in this yarn are so vibrant. 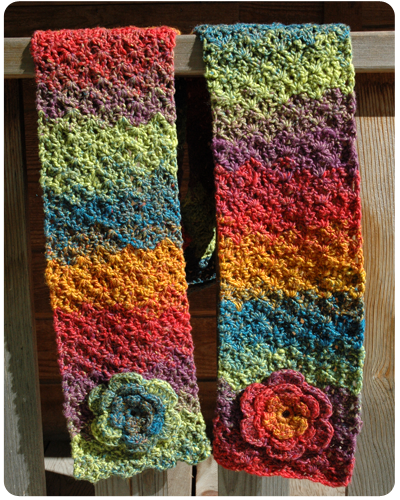 Because of the variegation and twisting of the yarn the color pattern in the finished product is just lovely. 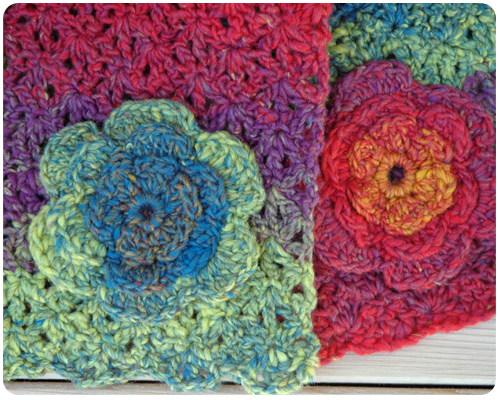 And I love the three dimensional flowers on the ends of the scarf - the perfect little detail. First, the weight of the yarn varied a lot as I moved through the ball - there were some times when the yarn was very thick (bulky) and other times when it was very thin (fine). As a result of this, the stitches were not all the same weight, so there seems to be some thinner and some thicker spots in my finished scarf. Also, the width of my scarf is not the same along its entire length, which I also think may be due to the differences in yarn weight through the ball. The thinner parts of the yarn were also very delicate and easily ripped apart. I discovered this when I was sewing the flowers on the ends of my scarf and had to tug my needle slightly; the yarn that I was sewing with ripped apart which makes me question the durability of the yarn and its ability to stand up to normal handling. I also noticed as I was working with this yarn that it got fuzzy and balled as I handled it. So, despite the gorgeous colors, I will not be using this yarn again to make any sort of garment. I feel like my scarf is much too delicate for everyday wear and that if I did use it everyday that it would pull apart and get all fuzzy. I do plan to use my leftover yarn to make flowers and perhaps a garland, but other than that I am done with Mosaic. While the colors are lovely, the variegation and twisting of the colors together eye-catching, this is not, in my opinion, a durable or dependable yarn. Have you ever made anything with Bernat Mosaic? What was your experience working with this yarn? Please share your thoughts and experiences in the comments. This is very pretty. I can understand how frustrating it must have been to work with a yarn that varied so much. Your scarf looks really cute. I love the flowers on the ends. Have a great weekend!